Fred and Myrtle Flutey are arguably New Zealand’s most beloved couple, best-known collectors, and are certified local celebrities. On top of it all, they were also warm and generous members of their community who loved sharing their passions with all who were interested. 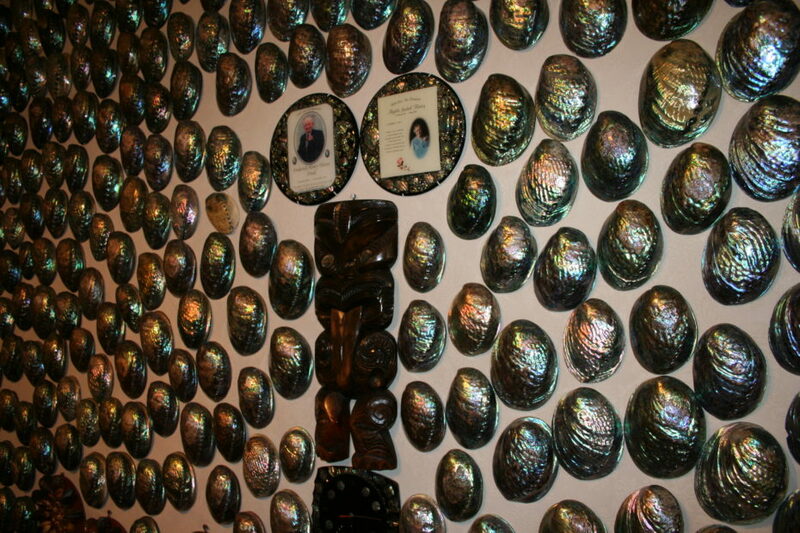 Over 30 odd years, more than one million people have passed through their private home, enjoying their hospitality, magnetic personalities and experiencing a first-hand-view of one of the largest collections of Pāua shells in the world. Found in shallow waters around the coastline, Pāua is the Māori name given to the large edible snails (Haliotis iris) which are considered a national delicacy. Their shells are even more loved, considered a local treasure and highly valued by jewellers because of their striking, iridescent colours. This story all started back in the 1960s when the Flutey’s were living in Bluff – a tiny town of around 1,850 residents in the lowest corner of the South Island of New Zealand. At that time Fred was working at the harbour and would collect Pāua shells for manufacturers and returned servicemen. 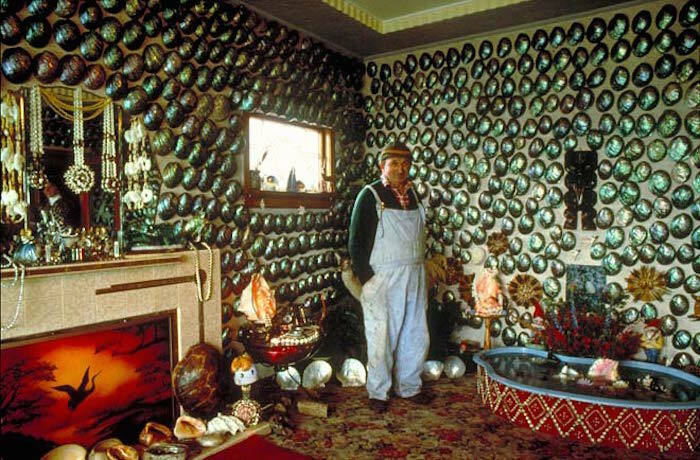 After getting rid of what he could, Fred then cleaned up the unwanted shells and took them home to add to the growing pile in the couple’s living room. The collection that grew slowly and steadily over the next 40 years now has over 1,170 individual shells and only happened to be because Myrtle was fed up lifting the shells off the floor to vacuum underneath. Faced with piles of the shiny blue shells spread out all over the room and the need to clean, Myrtle had a Eureka moment. 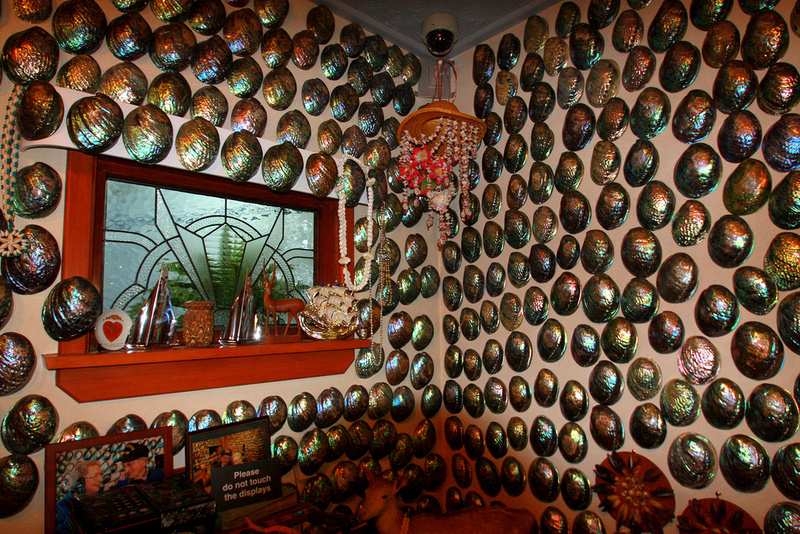 Grabbing some four inch nails, she started to hammer the Pāua shells around the mirror above the mantelpiece, and continued to do every time new ones made their way into the house. Soon after, every surface in that living room was covered, and that’s when neighbours and friends started taking notice. In 1963, the couple even got their own visitor’s book – so popular were the visits to the house at 258 Marine Parade. Passerbys left hundreds of calling cards, which were also collected and hung up as a part of the collection. Myrtle even began getting up at 6am every day, cleaning, scrubbing and readying the house to welcome visitors in by 9am. 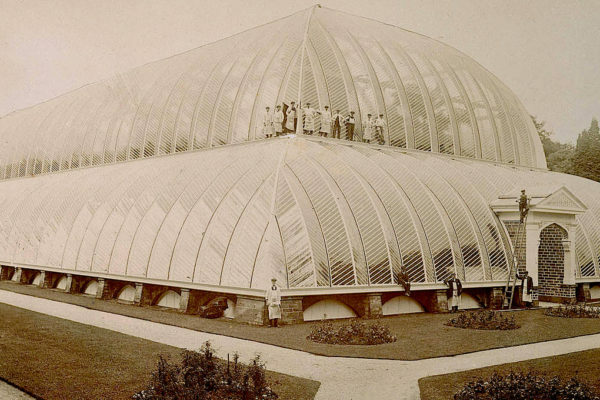 The Flutey’s love of hosting people and opening their home to the public for so long did not gone unnoticed, or unappreciated by local governmental bodies. 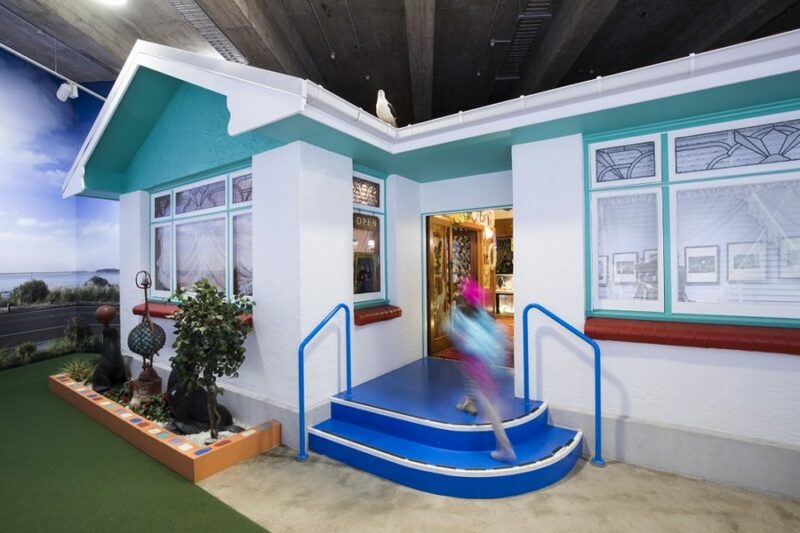 In 1990 they received the coveted Certificate of Merit from the New Zealand Tourist Industry Federation, and Tim Shadbolt – the former mayor of Southland also recognised the two shell enthusiasts as invaluable to the area, attracting nationwide attention to the furthest corner of the country. Fred and Myrtle have starred in three TV advertisements, a TV cooking programme and have even been featured on postage stamps and in tourism brochures. There have been three weddings held in ‘The Pāua Lounge’, including Eric Henderson – the couple’s own grandson. After Fred died on New Year’s Eve 2001, the shell collection was inherited by their grandson Ross Bowen (Myrtle had already passed on in May the year before) who controversially decided to move the collection north. Intended to preserve the collection and have it become a permanent display for all to enjoy, Bowen lent the Pāua to the Museum of Canterbury. Taking the responsibility very seriously, the Museum went on to build a replica of the Flutey’s home in Bluff, carefully recreating details as accurately as possible from photographs, video footage and the actual architectural plans of the house. 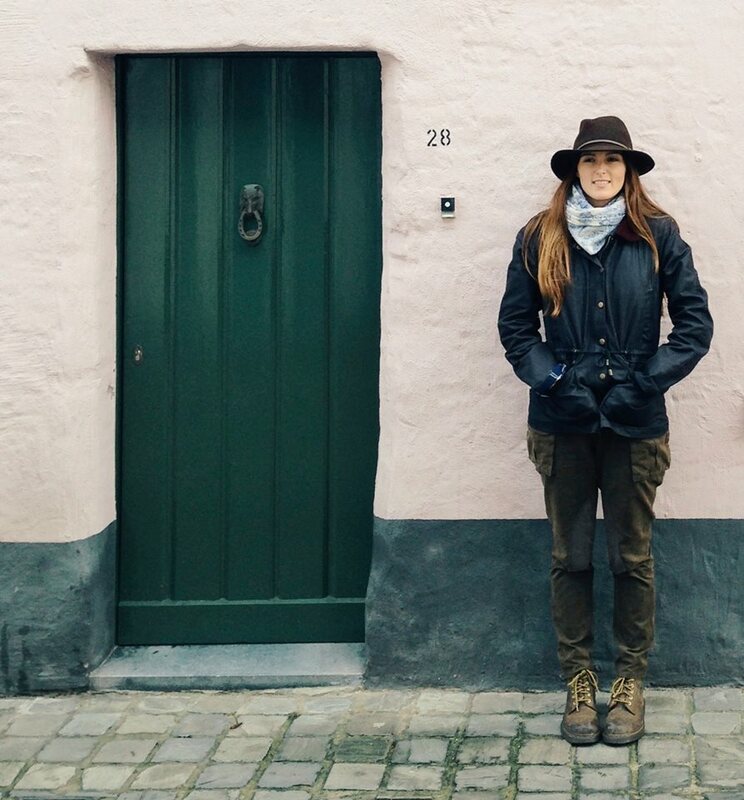 Sarah Whitehead was the curator in charge of the relocate, and together with several major sponsors, planned for one year on how best build the infamous home. 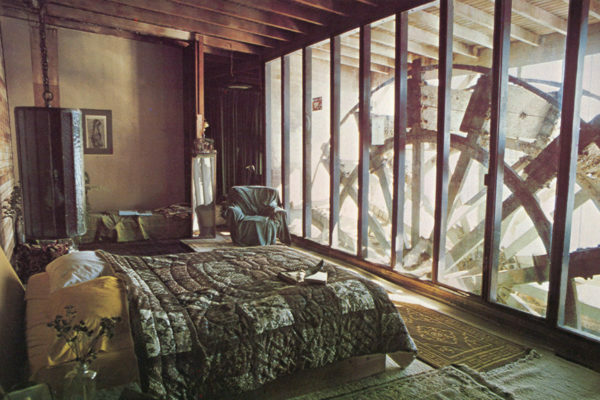 Windows were salvaged from nearby wreckers and building materials were donated to the project, or bought at wholesale price. 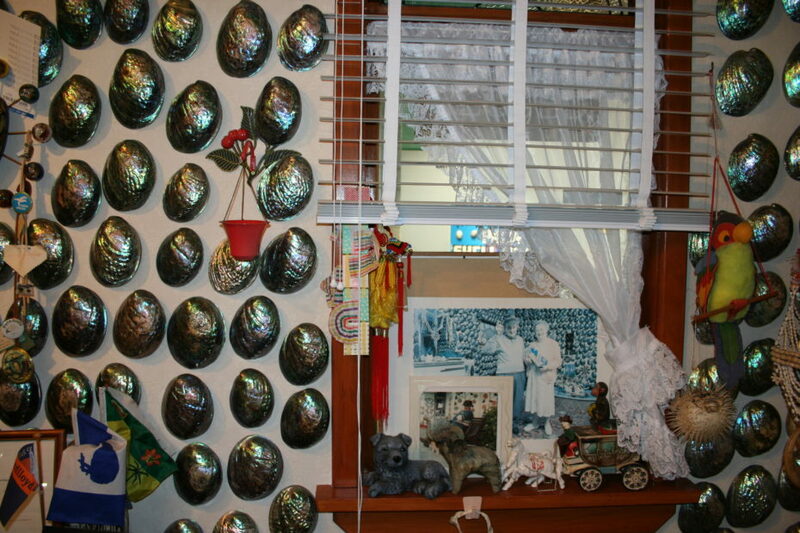 More than 4000 original items were taken from the house to include in the exhibit including the carpet, a Lions Club Banner which hung over the doorway, the house number from the outside fence, and the large concrete Pāua shell which stood in the centre of the lounge. 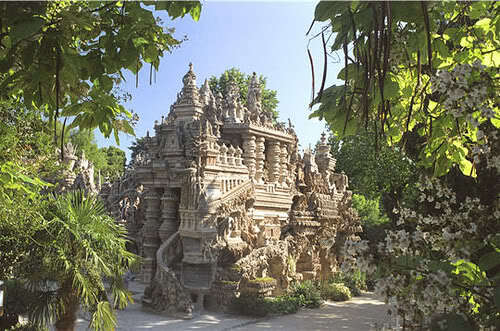 The exhibition opened on July 4th 2008 and had over 250,000 visitors through in the first two years. 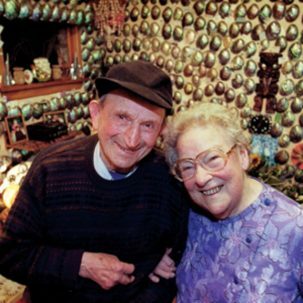 Complete with a short film on the lovable couple, the replica of the Pāua Shell House means we all can still get a glimpse of the hospitality and personalities of Fred and Myrtle even today. What may have started out as a collection fuelled by a side hobby 50 years ago in a tiny coastal town has since become a national institution, an iconic display, and an integral part of kiwi culture. But more than that, it has given the country two iconic personalties, who, it turns out, were as colourful and cherished by the nation as the shells they collected. If the Pāua House is your cup of tea, then you will fall in love with this story of the Postman who built a palace out of pebbles. 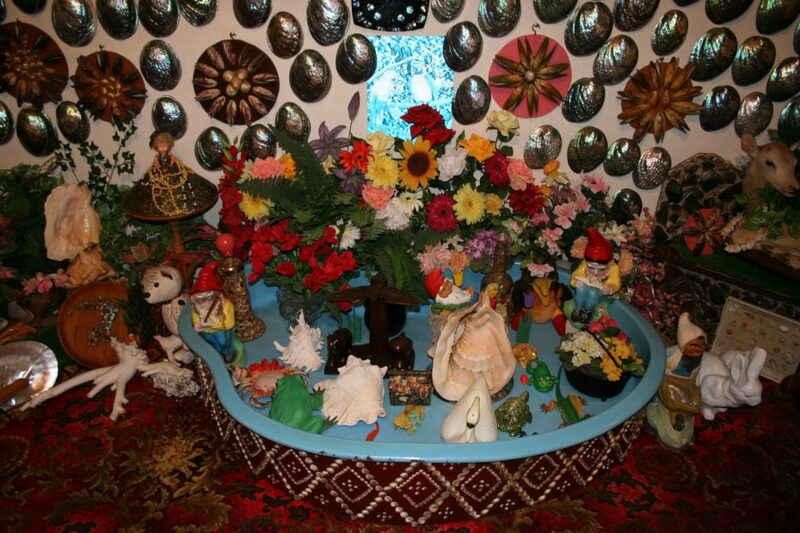 Or back on the shell theme: check out this miniature mermaid dollhouse.